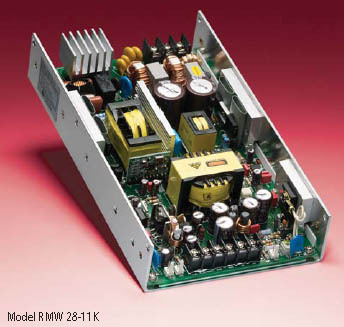 Kepco's RMW series are 300-watt general-purpose, U-chassis, single output power supplies, with model RMW 51212K-300 offering a triple output: +5V and ±12V. RMW are RoHS (Reduction of Hazardous Substances) compliant. Power factor correction (PFC) is standard, with the input power factor typically equal to 0.99. This minimizes the potential for the introduction of distortion on the a-c mains as the power supply's input conduction takes place over the entire a-c cycle. Remote error sensing is built-in. (A 4-wire Kelvin connection to the load eliminates the losses in the d-c load wires.) The output voltage setting is user-adjustable. All RMW modules are suitable as DC-DC converters, however note that Safety Agency approvals are valid only for a-c input. DC input voltage range for RMW models is 120V - 370V d-c.
RMW models can be mixed with your choice of Kepco modular power supplies (e.g., RKW open frame, RKW programmable, RMW, RKE, JBW, HSM, RCW) and packaged in one of our standard rack adapters for a custom power solution you design yourself. Or, if you chose, give us your specs and we'll design it for you. RMW are CE Marked per the LVD, EMC and RoHS 2 Directives. See applicable Declaration of Conformity.